A photograph of a Japanese-owned store hosting an “evacuation sale” prior to relocation, 1942. 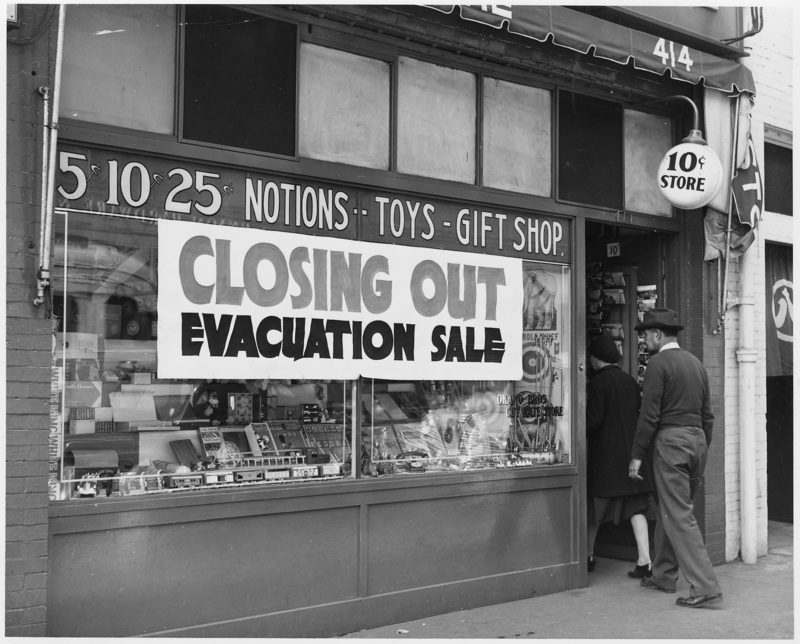 “Evacuation sale during Japanese Relocation,” Digital Public Library of America, http://dp.la/item/702db10b5c2595d9b90a31bdb3a4af23. Courtesy of National Archives and Records Administration. A painting titled “News of Pearl Harbor” by artist Henry Sugimoto, 1942. A poster captioned “All the ear-marks of a sneaky Jap! Don't discuss your job!,” created by the US War Production Board, 1942-1943. A resolution passed by the Japanese American Citizens League about Japanese American loyalty to the United States, December 22, 1941. A photograph of a Japanese American woman arriving at Tanforan Racetrack in San Bruno, California, 1942. A letter from Kenji Okuda to Norio Higano from Camp Harmony about his feelings on internment on Memorial Day, May 30, 1942. A letter from a teacher in Stockton, California about her student “Jimmie” who was sent to a relocation center, 1942. A column, excerpted from the Manzanar Free Press, about “what the world is saying” regarding Japanese internment in the US, July 27, 1942. A War Relocation Authority pamphlet explaining the background and nature of the US program for relocating Japanese Americans, May 1943. An instruction sheet for internee repatriation to Japan, July 1942. A photograph of the Hirahara family in their barracks at Heart Mountain Relocation Center in Wyoming, 1942. A photograph of students in a fourth grade class at Poston Relocation Center in Arizona, 1943. A photograph of Nisei soldiers at Jerome Relocation Center in Arkansas, 1943. A photograph by Dorothea Lange of the camp barracks and surrounding desert at Manzanar Relocation Center in California, July 2, 1942. A poster advertising a community forum on “concentration camps past and present,” 1974.